A gift from the New World to early settlers, squash was growing in the Americas more than 3000 years before Columbus arrived. Colonials were introduced to squash by Native Americans (the word is derived from the Narragansett Indian word “askootasquash”) who made it a major part of their diet due to its widespread growth. There are two categories: mild summer squash (like zucchini), with soft seeds and skins that are edible without cooking, and what we’re seeing in the markets today: flavorful winter squash, those with hard seeds and skins (more like shells) that need heat to become edible. Our area specialty is the unusual bright orange “Neck” pumpkin (sometimes called an Amish pie pumpkin), mostly grown in New England and Mid-Atlantic, with emphasis on Lancaster County, Pennsylvania. Always regional because it cannot be shipped or even easily transported due to its long neck (up to 24-inches), the belly of this squash is a small cavity filled with seeds. But the long neck gives a good yield of stringless pumpkin – the reason it was a field favorite of the frugal Amish. When the neck was bred out to improve transportation possibilities, it was called the Waltham butternut (named for the experimental agricultural station in Waltham, Massachusetts where the process first took place). In this case, we used another one of our favorite varieties, the acorn squash. The dark green skin (with deep ribs, like an acorn), yellow-orange interior and mild nutty flavor makes a good edible container for spicy vegetable chili. Make 6 small mounds of the salt on a baking sheet to help hold the squash halves steady. The salt also keeps the squash from resting directly on the hot pan and scorching the skin. Place each squash half in a mound of salt (skin-side down), drizzle with olive oil, and season with salt, pepper, and paprika. Bake until the squash flesh is fork-tender, about 25 to 30 minutes. 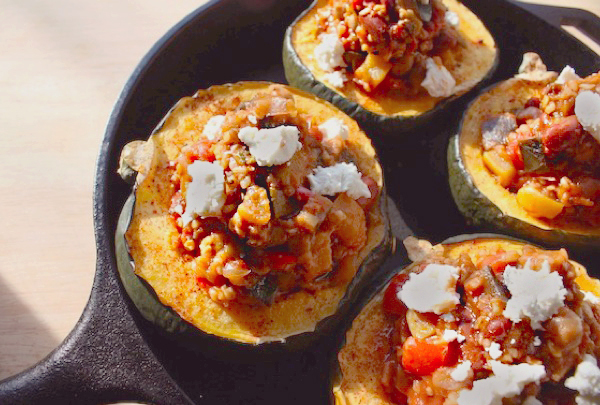 Fill each squash half with warmed chili, and top with crumbled goat cheese. Makes enough to fill the 6 squashes – maybe with a little leftover. It all depends upon the size of the squash. Over moderate heat, warm 1/3-cup olive oil and cook 4 cups chopped onions until softened and translucent. They should not brown. Sprinkle spice mix* over onions and cook, stirring frequently, until onions are well-coated and you can smell the spices, about 5 minutes. *Spice mix: 1-1/2 Tbsp chipotle powder, 1/3-cup chili powder (mild, like New Mexican), 3 Tbsp ground cumin, 3 Tbsp Mexican oregano, 1 Tbsp granulated garlic (not garlic salt or powder), 1 Tbsp dried thyme. Add one 35-ounce can whole Italian tomatoes (broken up) with their juices and 3 cups chicken stock, stirring well so spices from onions begin to drift through the liquid. Bring to boil, add 1 Tbsp salt, and lower heat. Cook, partially covered, until well-combined, about 30 minutes. Stir in 2 cups diced red pepper and simmer uncovered until softened, about 20 minutes. Add 1/3-cup coarse wheat bulgur that has been soaked in 1 cup orange juice (until all liquid is absorbed, about 30 minutes), and cooked until chili thickens, about 25 minutes. Add one 15-ounce can garbanzo beans and one 15-ounce can kidney beans (both drained and gently rinsed under cool running water). Add one 16-ounce bag green beans and one 16-ounce bag corn kernels (both defrosted, thoroughly drained, and dried). Stir until well-combined, simmer just until vegetables are warmed through, about 5 minutes, taste for seasonings and serve.